It is all about website conversion right now. Your blog traffic numbers don’t matter if the traffic doesn’t convert. Converting your blog readers should be your ultimate goal. So what is conversion? And how do you measure one? That’s really out of scope of this post, but I can tell you briefly. Scenario A: If you get 1000 hits to your site per day and if 100 people (out of that 1000) sign up to your email list, you have a 10% conversion rate. 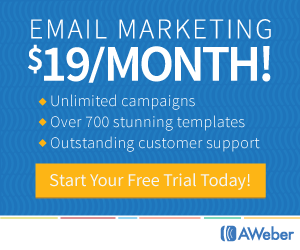 Signing up for your email list is just an example. It could also be “buying your product” or “contacting you to get a quote for your service”. Scenario B: If you get 500 hits to your site per day and if 100 people take action, then you have a 20% conversion rate. So which scenario is better? People mostly go after increasing website traffic (Scenario A has more blog traffic compared to Scenario B). But if you manage to get your conversions up, you can do well with whatever traffic you are getting. On a side note, I am NOT telling you to settle for 500 hits per day and work on increasing your conversions to 100%. You should work on both – increasing traffic and conversions. I’ve explained what the term “conversion” (in the context of blogging) means. How do you measure your conversion rate? That really depends on what YOU define as your goal. Some bloggers want their readers to join their email list; for some conversion is all about product sales; or affiliate purchases! You can only measure your conversions if you define your goal. It all starts with a good understanding. And, you need to know someone first if you want to understand them. That means, you should clearly know your target audience. Be precise. Ask yourself this question: Who are you creating content for? Answers like “Bloggers”, “Women”, “Children” are NOT accepted. Why? Because they are TOO vague. Too broad. You have to narrow down. Get precise. Once you clearly know to whom you are writing, you should take efforts to understand your readers. Where does your ideal reader hang out? What is his/her pressing problem? What is his/her fear? What makes him/her happy? A good understanding about your target audience will help you deliver what EXACTLY he/she wants and BINGO! 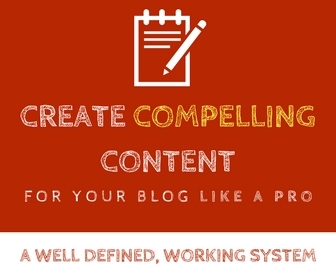 Now, most bloggers tend to misuse the information they get from step #1. Of course they take pain to understand their readers well. But they use that information so they can benefit from their readers’ pressing problems or fears. Writing blog posts or sales letters that take advantage of readers’ problems is what I mean here. There is a fine line between being a great marketer and being a salesman/woman. Great marketers don’t market features; they market values. To market values your product or your content should have them, right? Always think from the point of view of the reader. Think what value will my reader get by reading this blog post, or buying this product of mine. That’s how you empathise. People can smell this (great) attitude of yours a mile away and your website conversions will skyrocket. This step is quite close to step #2, yet quite different. Apart from misusing readers’ vulnerabilities, acting like a business man is being too salesy. If there’s sales pitch in everything you produce, you will drive people away from your website. That’s exactly the antonym of conversion. Stop publishing content that always asks people to buy your product or sign up for your service. I am not advising you against call to actions – in fact having call to actions is a crucial step in this process. Yet, you have to set the limit right. Take a good look at your website’s sidebar, your blog posts, your newsletter and your social media updates. If it is all about “BUY”, “BUY NOW” – you are being a business man. No doubt. Sounding like a sales man means you are “me” focused. You only care about making that sale or making that commission; you don’t care about your readers. And yes, your readers can smell this (bad) attitude of yours a mile away! And you won’t have any scope to think about conversions. Don’t hold back. Being generous with providing the necessary help counts a lot. It helps build the bond between you and your readers. You can earn loyal readers and repeat customers if you are a generous giver. And being generous will earn you lots of fans. And people will spread the word via word of mouth marketing. 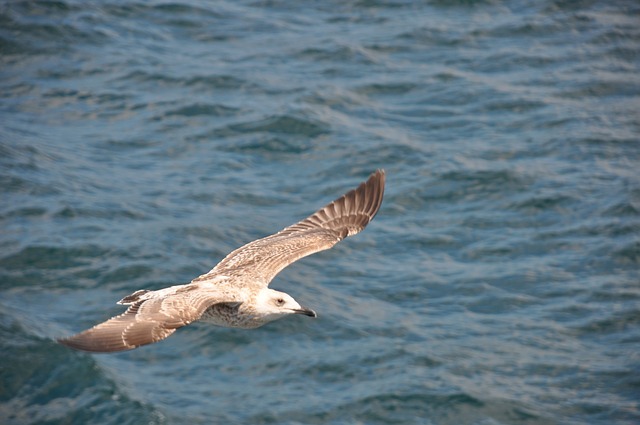 You can help/share generously both inside and outside your blog. 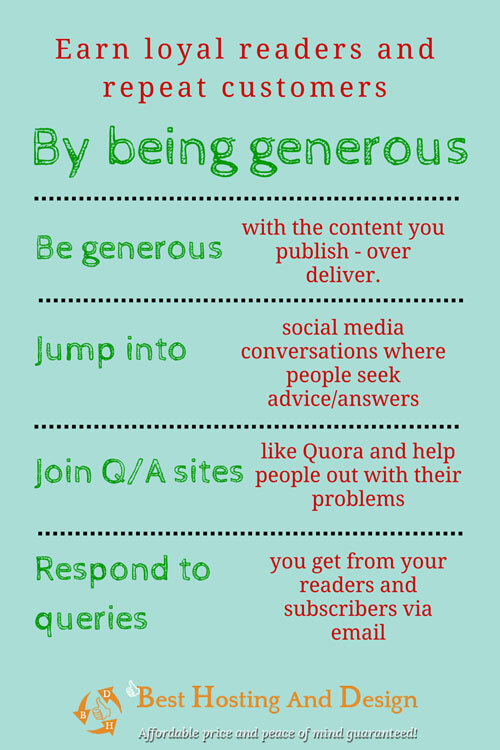 • Be generous with the content you publish – over deliver. • Jump into social media conversations where people seek advice/answers. • Join Q/A sites like Quora and help people out with their problems. • Respond to queries you get from your readers and subscribers via email. Thorough content is what wins in the current era. A 500 word casual post on a given topic won’t work anymore. You can only scratch the surface on any topic with a casual 500 word blog post. To discuss anything thorough you need to go far beyond 500 words. Make no mistake – I am not asking you to measure the quality or thoroughness of your content by the number of words in it. But I hope you get my point. Your readers will respond nicely to your call to actions if your content is thorough – it shows you care! Next comes consistency. You need to get into an agreement with yourself to publish consistently. No excuses. Be prepared for times when you cannot stick to the schedule. And be prepared for the worst. Life can come in the way. You could get sick. Emergencies, funerals – you name it. Have a few blog posts written, ready to be published well in advance. Even if you get into a crisis, you can still stick to your publishing schedule without panicking. Consistent publishing helps people to remember you. And it also shows you care. So I told you earlier that you should not sound like a business man. Call to actions are essential for conversions. You have to find the sweet spot – between having strong call to actions and being too annoying. Call to actions help people who are in a hurry, and those who are confused. Many readers who land on your blog don’t clearly know what to do next, after they have read a blog post, for instance. Telling them explicitly what to do is call to action. Like the sign up form at the end of this post. Call to actions need not be essentially at the end of the post. You can include them anywhere – just make sure you don’t get annoying to your readers. Now comes the crucial step. 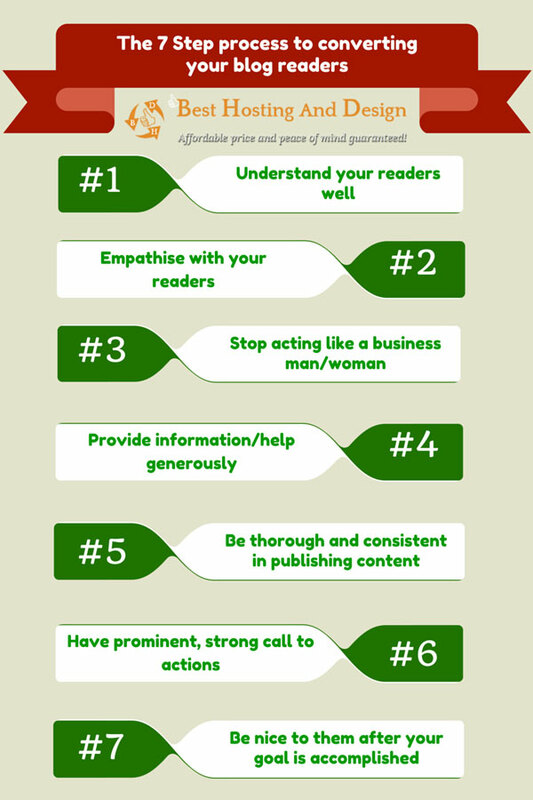 Now that you have succeeded in converting your reader, why should you have step #7? It is indeed an important step. Getting a sign up or getting people to buy your product is not all. You don’t win them forever unless you continue to be nice to them (and follow steps #1-#6 religiously). As you know, your subscriber can unsubscribe at any time if they don’t like what your emails/content/your approach whatever! The customer who just purchased your product could return it and ask for a refund! In order to win loyal readers, repeat customers and fans, you have to continue to be nice all the time. Don’t empathise, understand, help and over-deliver only to close the deal and then stop caring. Not just for blogging, it is in general not a good practice. How good is your website conversion rate? Do you measure your website conversion rate? For that you need to know your goal first. Clearly define your goals and then measure your progress. Follow the 7-step process outlined above. It works. Let me know if you have any other tips to help increasing website conversion rates. After all converting your blog readers should be your ultimate goal! You laid out a great strong foundation here when it comes to converting the traffic you get. Each step is essential in and of itself and I can’t name one that no one can’t do without. The only thing that I would add is to check on your metrics. The reason why I say this is that for a long time I wasn’t getting conversions like I wanted to, so I had to do some investigation on why that was. I found the culprit which was there was something wrong with one of my opt in forms, which hindered anyone from optin in. So I concentrated some time on fixing this which took me a while. All of this was finding out through one of the metrics in Google Analytics called Funnel Visualization. But besides that everything else worked well. Thanks for sharing Jane! I hope you have a great rest of the week! Thanks for stopping by to share your thoughts here. And thanks for the great addition! Monitoring the metrics – yes it is so important. Without pausing and analyzing we don’t know what works and what doesn’t work. And without that knowledge we could be wasting our time on stuff that don’t work. See, that is a great lesson that you learnt – misbehaving optin forms are really bad! Right now my conversion goal would be to get comments on my latest blog post since I’m not actively building a list and I’m not selling anything right now (I do have a WordPress product but I’m not promoting it). I wanted to chime in on #7 here though because this is a mistake I see often, as soon as people convince their readers or subscribers to buy something from them, they completely forget about them and start looking for someone else to lure in. In my personal experience I think that’s a terrible way to do business particularly when we expect so much from the other person in return (over delivery) and get exactly the opposite in return. Some marketers do notice their sales go down after conducting business like this and adapt to change but some others never do it and couldn’t care less if people think less or more about them. Thankfully, there are people genuinely interested in their clients first and put their revenue on a second layer. Thanks for your wonderful comment! Indeed #7 is a painful fact. Most marketers ignore their customers once the sale is closed. Which is why we hear about a lot of after sales support issues. I mostly look at the after sales treatment I get with any company to determine the quality of the company. Personally I value the support much more than the product/service itself. Just being genuine and looking like a real person goes a LONG way. Sure it does! Thanks for your comment. Hi Jane, truly awesome post, really encouraging and a reminder of how important it is for bloggers to focus on their website conversions, no matter what their goals are. For me it’s currently about growing my email list, and although I’m really happy with my current conversion rate, I know there’s much more I can do to increase it. I’ve just started doing A/B testing for some of my opt-in forms and they’re really giving me an insight into what works and what doesn’t. Point number 3 in your list above took me a while to figure out when I first started selling on my blog years ago I’ll be honest, especially coming from running an eCommerce business before blogging came along. Point number 4 I always try and do my best to over deliver on quality and value, one of the ways I’ve been able to do that I think is by dropping my posting frequency. Point number 7 really stands out for me too, because you’re spot on with saying that a customer or a blog subscriber can easily change their mind about something, if they’re not happy with your product or service they received, or even they’re not happy with the way they’re being treated. It’s nice to reach out to one or two of your new subscribers to and make a greater connection, it definitely shows you care about them and value their interests. It doesn’t always work, but most of the time it does. Marvellous post Jane as always, have a great weekend. Thanks for stopping by. Website conversion is somewhat overlooked by bloggers as I can say from my talks with my clients. They value traffic a lot and totally forget about what they need to be doing with that traffic. And yes maintaining the relationship and trust after closing the deal matters a lot! Thanks for sharing your wonderful thoughts. Have a great week! Wow Jane, what a great share. I know so many people are always eager to start blogging but then they don’t always seem to have an end result in mind. Like I know they want their content read and shared but what do they want their readers to do? Not everyone is here to build a business, that I understand, but those of us that are need to be able to convert our traffic into customers. That’s just part of this process that we all need to keep testing and tweaking until we find the perfect formula for us. I love your graphics and how you spelled it all out, really great share. I’ll definitely be passing this one around too, great lesson. Welcome to spring and hope you have a wonderful weekend. Exactly! Most bloggers don’t know what they want their readers to do. That is a biggie. Without that clear vision, there is no point in creating content or promoting it for traffic! Website conversion is the key – it is how the blogger is going to get what he/she wants with the blog. Hence it is highly crucial to put in the time and effort needed to boost website conversions 🙂 Which is why I wrote on this topic. Thanks for sharing your precious thoughts Adrienne 🙂 Have a wonderful week! Have to disagree slightly when you say to work on both. I think it’s best to put everything in place to make the best conversions possible, then do all the work to increase the traffic flow, but I understand what you mean, that you don’t neglect and stop sending traffic altogether. So I guess we’re on the same page because I’m mainly referring to sending a boost of a bunch of traffic or paid advertising or whatever. Maintaining the ‘steady regular stream’ can definitely be done simultaneously in my opinion. You are spot on with number one (and the rest too), and I can relate to this so much. I really try to understand what the pain points are of my target audience, how to learn to speak in their language, and what triggers them to make certain decisions. It takes a lot of work but well worth the research. Yes, I completely agree. Being a good marketer means that your selling is almost undetectable…just a natural flow of conversation that’s completely relevant and timely. Great points, all of them, Jane – well done! I enjoyed reading, and will be sharing this out. Great post here Jane, and one I can relate to. Understand your readers. This is one I’ve struggled with in the past. I went around and around when I first started my current blog, and never really like where I was landing. Wasn’t really sure who I was targeting. I finally thought I nailed it, but lately I’ve been second guessing myself a bit. Maybe because I’m focusing on too broad of a niche. My point is it’s never too late to tweak things and adjust your focus to those readers you are trying to target. Consistently publishing content is another area I need to work on. Given I do this blogging thing on the side, my goal is to publish something every 2 weeks. I’ve had things come up in the past where even that schedule can prove challenging. It comes down to time management. If I don’t have the time to publish, I surely don’t have the time to create additional posts to have on hand if something comes up. Thanks for the post Jane, have yourself a great weekend. I laughed at #3 because when I first started blogging that was exactly my mindset. Oh how much more fun you can have by showing some personality. I agree and enjoyed every tip you mentioned. I absolutely agree with you on conversions too. That stood out big time since I am doing some work behind the scenes right now to make the primary focus of my visitor is converting them. Have a great rest of the weekend Jane! First off, I’d love to get 100 people to sign up a day. Wow. Well, I’m working my way towards that. Understanding your readers and empathising with them is very key. You have to show that your human and not only how emotion, but know what your readers want answers to. Regarding providing helpful information … that’s key as well. If you don’t provide answers that they want, they’ll go somewhere else for it. And probably won’t return to your site again. Great graphics. Even better post. This topic grabbed my attention when I seen it shared on Google+ because the word “conversion” peeked my interest. All points mentioned are gems. We have to be ourselves and not sales people because people like to read something of value to them. Over-delivering is one thing that really works. We also have to know who are readers are so we do need to be niche specific. I find that writing lists and fine tuning it really had made a difference in my content. When you mention a good call to action, indeed, it is imperative. So many people will visit our blogs and not know quite what to say. Give them an opening to make it easy for them to comment. When it comes down to it all, we do have to put others first and when they do come in, we need to treat them like gold. I love these 7 tips because I believe they work. I try to follow them religiously! Just the other night, someone tried to buy from my PLR store and she was having problems with PayPal. She took the time to write tome and I felt bad for her. I told her to pick anything from my store as a ‘gift’ because she was having problems with PayPal. She was elated! It’s important to treat your followers and customers like GOLD because they remain loyal to you when you do. This was a great post and every blogger should take it to heart! Have a great day, Jane!